This towel holder is everything that I expected it to be. It is so nice to be able to put two towels onto this holder on the bathroom counter. I think its a nicer touch than just placing the hand towel on the counter itself. Hang towels for guests on this sturdy freestanding towel holder to make convenience a priority in your powder room. 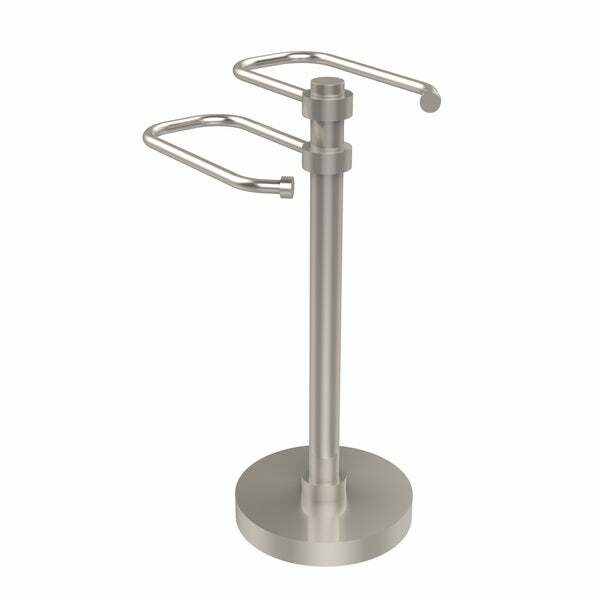 This two-armed towel holder requires no installation, making it ideal for placing on your bathroom counter to hold washcloths and hand towels. It was expensive but well worth the cost. It is very well made. We love the finish of the nickel and how it has stood up in a humid environment. We had to have something for our rental as we can’t put holes in the wall. This was the perfect compromise and allows us to hang two hand towels at once. "What is the height of this hand towel holder?"